Say it in your best Stefon voice: "This concert has everything: a Brinks truck, face tattoos, belching dry ice, palm trees, Pegasuses, 'splosions, security helping a fan search for a missing tooth, a flash lightning storm, nuclear waste barrels, confetti, $16.50 domestic beers, Muskoka chairs, a guy dressed like Where's Waldo, the Beatles but black…"
Yes, even if it were not to occur minutes after the skies opened up and a deluge smacked Toronto's lakeshore amphitheatre, a Rae Sremmurd show comes with a certain amount of mayhem and randomness. Nothing feels connected, but everything is linked by the never-ending bass pulse you'd like to inject right into your veins and the manmade green cloud that hovers in the air. "We smell y'all!" confirmed Swae Lee from the stage. Somewhere in the back concourse, a lady at a concession stand was selling $40 T-shirts that promoted "DRUG AGAINST WARS" in all caps. It was a shrewd move for the affable, lanky Wiz, now 30, to tap the younger, hyper Rae Sremmurd for this 27-date Dazed & Blazed tour (limited to brief warm-up sets, O.T. Genasis and Lil Skies also tag along for the ride). But the team-up comes with a risk: despite going on early, Rae Sremmurd outworked and out-engaged their mellow, comfortable headliner. Skittering onstage in glitter jackets just after 8 p.m., when rain-drenched concertgoers could still be heard complaining about their soakers in the men's room ("Mine's up to my knee! Super soaker, dude! "), the saggy-pantsed Brothers Sremmurd wasted zero time hitting us with bangers, opening with "No Type" and "No Flex Zone." Before two songs were complete, the jackets were gone and it was all tatted-up, skinny naked chests and ambition. The duo took turns bouncing on the monitors and piggybacking a linebacker-esque security guard into the crowd to touch the people. Generous with their energy, Swae Lee and Slim Jxmmi have built their set around their bulky, new triple-album SR3MM. Momentum dips slightly during some of their solo material — their sum is much greater than their parts — but "Perplexing Pegasus," "Powerglide" and "Buckets" all won. Fifteen women were trotted onstage to shake their posteriors for "Come Get Her," and half of the ladies filmed themselves with their smartphones the whole while. Before climaxing with the incredible "Black Beatles," the duo trotted out surprise local guest and OVO artist Baka Not Nice to rip "Live Up to My Name," a nice touch on a wild performance. 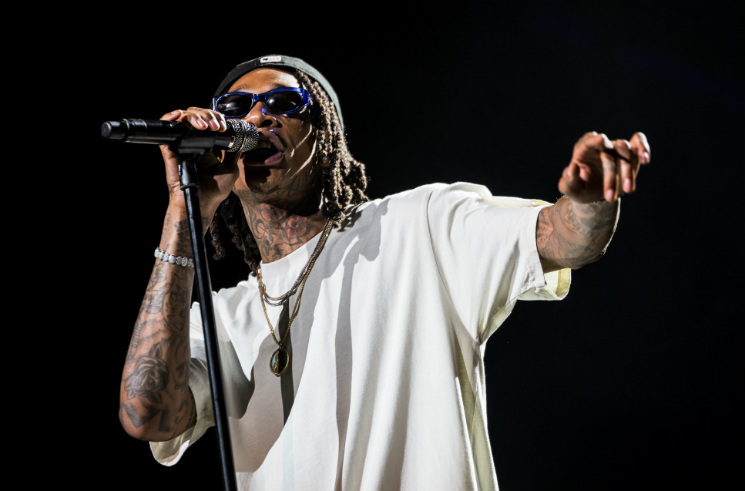 Like Cypress Hill before him, Wiz Khalifa has become a staple of the summertime outdoor musical romp, drawing upon the weed-devoted legions and trotting out familiar radio and party anthems. But one gets the sense that the headliner — who at various points in his career has been a mixtape hero and fresh rap voice, a crossover pop star, a jock-jam specialist, Snoop's younger, cooler buddy, a relentless performer and a celeb romance gossip magnet — is running out of tricks. His latest release, Rolling Papers 2, is a cumbersome, 25-track sequel that feels like a rehash. As such, Khalifa seemed hard-pressed to reach the energy bar set by Rae Sremmurd, so he eased into his 70-minute set with some calmer material, standing centre stage at a mic stand before breaking out the no-brainer hits: "Hunnid Bands," Black and Yellow" (complete with explosions of same-coloured confetti), "Work Hard, Play Hard" and "We Dem Boyz." Gigantic inflatable blunts were chucked into the mosh area and volleyed like beach balls. Backed by a four-piece band — DJ, bassists, drummer, keyboardist — Wiz smiled often and performed with expertise, but the returns of Swae Lee and Lil Skies for call-back cameos gave him that extra boost. That squeaky-clean pop hits "Young, Wild & Free" and the mushy "See You Again" were his best-received tunes say much about where he now slots as a touring act.